Our authentic and traditional programs in tai chi, yoga, meditation, and Chinese martial arts will do more than just get you into the best physical shape of your life. You'll also be cultivating and developing your mind and spirit to the highest levels and attaining greater harmony, wisdom and satisfaction in life. Tai Chi is an “internal” art which helps to develop “chi” or internal energy for health and vitality. It is a “moving meditation” which calms the mind, relaxes the body, and strengthens the spirit. We study and train in Shaolin Kung Fu, the most comprehensive martial art, with the objective of cultivating the body, mind and spirit. Used to achieve peace, relaxation and inner knowing, meditation is now recognized by Western medicine to be effective for healing and pain management. We offer Taoist, Buddhist and CSM (clinically standardized meditation), often used in hospital settings. Learn the health and longevity exercise secrets of the ancient Chinese. Come and enjoy a 4,000 year old method for wellness that combines both the breath and physical movement of the body to promote healing and restore energy balance. These gentle, controlled movements are designed to facilitate and enhance the “life force” or “Chi” and will benefit anyone regardless of age or ability. Mulan fan dance is a Kung Fu martial art form that combines beautiful Tai Chi with traditional dance movement. The form improves grace and balance, promotes physical and emotional health, and enhances internal force or energy flow. It provides a gentle system of exercise for promoting health and vitality. If you don’t have time to exercise and working out at the gym is too demanding, Mulan fan dance is for you. As with Tai Chi, the benefits are not just physical; the meditative aspects of Mulan fan dance and its emphasis on relaxed movement contribute to serenity of mind and clarity of thought. 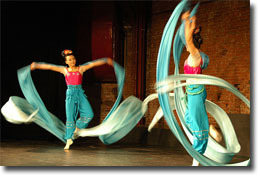 The Ribbon dance is one of the most popular of Chinese folk dances. The spirited Ribbon dance uses long Silk Ribbons which create calligraphic designs in the air. Waving yards of bright silk, the dancers create a visual collage of circles, swirls, corkscrews, and curlicues. The waist drum dance is a type of Chinese folk dance. It has a unique style which integrates dance, song and martial arts into a whole performance. Drum rhythms set the pace and combine movement into one; the dancers turn, kick, and jump while hitting the drum. The atmosphere and rhythms are lively, strong and enthusiastic. The waist drum dance has become an exquisite work of folk art. Guest lecturers, field trips to places you have never been, Chinese cooking classes, parties and holiday gatherings, parent’s night out, and more! Pictures of some of the past events are in the photo gallery. Interested in trying Tai Chi without joining a class? You can attend six classes for $120! Give us a call at 914-669-0888. This class runs continuously; you can join at any time. Please see the schedule for class days and times. For centuries the Chinese have practiced the life-enhancing art of Tai Chi. Today millions more around the world have joined them. Tai Chi, an "internal" art form, concentrates on cultivating internal energy which the Chinese call "chi". It is this internal energy that is responsible for the health benefits that Western medicine also now recognizes. These benefits include lowering blood pressure, boosting the immune system, improving balance, and counteracting depression, anxiety, mood disorders, and ADHD. Rooted in Eastern philosophy, Tai Chi has been called a "moving meditation" due to its slow, graceful appearance and relaxed softness of movement. It, along with the other internal arts, is famous for calming the mind, relaxing the body, and strengthening the spirit. Complimenting the internal arts is a series of specialized exercises known as Qigong (Chi Kung). Qigong focuses on the breath and the mind and concentrates on strengthening specific body areas and energy meridians. Learning all that is contained within Tai Chi could take a lifetime. In addition to the regular classes that include Qigong exercises and the Tai Chi form, Dragon and Crane also offers classes for those interested in advanced learning. Advanced classes include a full spectrum of Tai Chi training such as numerous push-hands forms, the beautiful Tai Chi Jien sword and other weapons forms, and the rarely seen Tai Chi two person sets. Participants in the advanced classes may also become candidates for teacher certification. Interested in trying Shaolin Kung Fu without joining a class? You can attend four classes for $120! More than 1500 years ago in China the Shaolin monks embarked on a lifelong journey toward enlightenment. In their quest for self-development and self-growth, they recognized that body, mind, and spirit were inseparable. With this understanding they developed a three pillar approach to training. Martial arts and Qigong (chi kung) developed the body, meditation cleared the mind, and spiritual inquiry answered the deep questions of the soul. At Dragon and Crane we adhere to this traditional three pillar approach and teach authentic lineage Shaolin Kung Fu styles including Tan Tui, Mei Jong, and Lohan Animals. 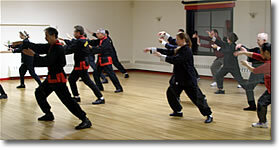 Shuai Chiao and Kenpo, two other systems of Kung Fu, are also taught. Shaolin Kung Fu is the most comprehensive of all martial arts. Often referred to as the “grandfather” of Asian martial arts, Shaolin has influenced the development of much later arts such as Japanese karate and Korean tae kwon do. In the tradition of the Shaolin monks, we look at martial arts mastery as a lifelong process and aim to help you build a strong foundation for optimal progress. As an adjunct to Kung Fu we teach Qigong, breathing methods, physical and mental conditioning, sparring, weaponry, and self-defense applications. Meditation classes and spiritual inquiry round out the three pillar approach. Meditation, the practice of focusing the mind, can be used to achieve peace, relaxation, and inner knowing. Western medicine recognizes the benefits of meditation for reducing stress, lowering blood pressure, healing and pain relief. There are many different types of meditation – from guided visualization to mantra chanting – and it may take some time to find the right one for you. At Dragon and Crane we offer various styles of meditation in the Buddhist and Taoist tradition. Master John's background includes over 35 years of meditation experience as well as training in the Chuang Yen Monastery. As a professional Human Development Specialist M. Ed. and Counseling Psychologist MA, he brings a unique depth and understanding to the practice of meditation. As a participant in the development of Clinically Standardized Meditation at the Graduate School of Columbia University he helped bring meditation closer to the forefront of western medicine. This program is for women of all ages. It combines movement and breathing exercises specific to the energy needs of women. You will learn dynamic yet gentle Chi Kung techniques to harmonize your chi, renew your energy, and improve balance, strength, and flexibility. Chi Kung for Women will inspire you and improve your overall health. Pre–registration for a minimum of two months is required. If you would like more information, please contact us. Popular in Asia for thousands of years, yoga incorporates advanced stretching and strengthening postures that loosen the body and quiet the mind. Yoga can help you develop greater strength, coordination, flexibility, and balance. Shaolin yoga is a complete system for training the body, mind, and spirit through breathing exercises, meditation, contemplation, and reflection in addition to the stretching postures. We teach the postures and methods that have been practiced for centuries in the Shaolin and Taoist traditions of China. Many of the techniques we teach can be traced to the Shaolin Temple, a haven where yoga, meditation, and martial arts merged in the common quest for self-cultivation and enlightenment. 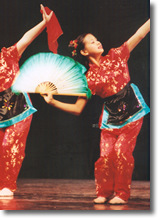 Want to perform at our next Chinese New Year show? Taking this class will give you that opportunity! Mulan Tai Chi fan dance is an art form that combines beautiful Tai Chi with traditional dance movement. The form improves grace and balance, promotes physical and emotional health, and enhances internal force or energy flow. It provides a gentle system of exercise for promoting health and vitality. If you don’t have time to exercise and working out at the gym is too demanding, Mulan fan dance is for you. As with Tai Chi, the benefits are not just physical; the meditative aspects of Mulan fan dance and its emphasis on relaxed movement contribute to serenity of mind and clarity of thought. Ribbon dance began in the Han dynasty (206B.C.-420A.D.) and became very popular in the Tang dynasty (589-907A.D.). There was a story about a man who tried to kill the Han Emperor. Hsiang Po, using his sleeve, blocked the sword and saved the Emperor's life. The Han people wished to remember him with gratitude. They choreographed the sleeve dance with the dancer holding short ribbons symbolizing Hsiang Po's sleeve. Tang is the golden age of dance and Art in Chinese history. The Ribbon dance has been attributed to Emperor Tang Ming Hwon and his consort Yang Gwei Fei. Chinese legend has it that Emporor Tang Ming Hwon, who reigned from 713-755, once dreamed that he was in the moon palace with many fairies singing and dancing in multicolored cloud-like long robes. The dance with the flowing silk ribbons was accompanied by Chinese instruments. During the Tang Dynasty, people used longer ribbons which resulted in more pattern variations. Ribbons were later attached to sticks which made the dance more lively and creative. At the heart of ribbon dance's enduring popularity are the various images and emotions that the ribbons can portray; passionate as a beautiful rainbow, lithesome as a wandering dragon. The dancer is always inspired by a sense of freedom. It truly creates a free spirit and loving heart. 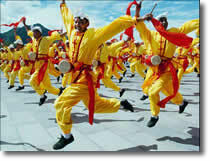 The waist drum dance is a type of Chinese folk dance. It has a unique style which integrates dance, song and martial arts into a whole performance. Drum rhythms set the pace and combine movement into one; the dancers turn, kick, and jump while hitting the drum. The atmosphere and rhythms are lively, strong and enthusiastic. The waist drum dance has become an exquisite work of folk art. PLEASE CONTACT US TODAY AND CHANGE YOUR LIFE!